Dental technology is continually growing and changing, and we’re proud to say that our office is able to keep up with this progress. We continually update our practice so we can give our patients the absolute best that dentistry has to offer. With the newest tools, everything from diagnostics to treatment can be performed faster, safer, and with more comfort. Read on below to learn more about some of the great tools we use every day. 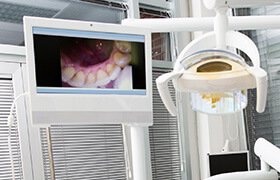 This small, pen-shaped device is tipped with a high-resolution camera, and we can maneuver it comfortably within your mouth to capture detailed images of your teeth and gums, which we can then display on a large chairside monitor. They’ll make it much easier for us to catch dental issues (especially in those areas hidden from the naked eye), and it’ll also give you a “dentist’s view” of your smile, helping you better understand the state of your oral health. 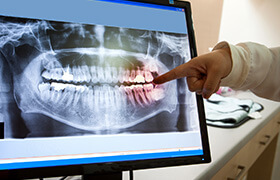 Our office only uses digital x-rays as opposed to traditional film-based ones because they are better for us, our patients, and the environment. They take much less time to be created, they don’t require harsh darkroom chemicals to be developed, and best of all, our machine emits up to 90% LESS radiation than a traditional one. With it, we can find potentially hidden dental problems even faster while giving our patients peace of mind. 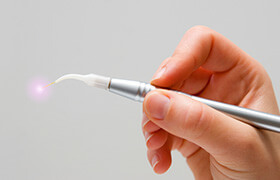 Dental lasers can be used to perform a wide array of procedures, be they cosmetic or restorative. They’re ideal for performing sensitive procedures on the gum area, as the highly-concentrate beam of light can remove excess or infected tissue almost painlessly. This can help treat/prevent gum disease or even improve the appearance of a gummy smile. In the end, they help reduce any discomfort, swelling, or bleeding a patient might experience, as well as shorten their recovery time. 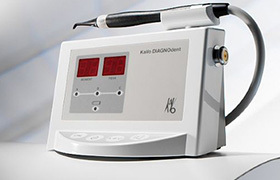 This tool allows us to catch tooth decay at its earliest stages, much sooner than we could with a traditional exam. It uses a beam of light to detect the thickness of the enamel, and if any thinning is present, it’ll let us know instantly. From there, we can use a variety of conservative treatments to strengthen your teeth and prevent you from ever developing a cavity. In the end, this will allow us to save more of your teeth, which is ideal for your long term dental health!